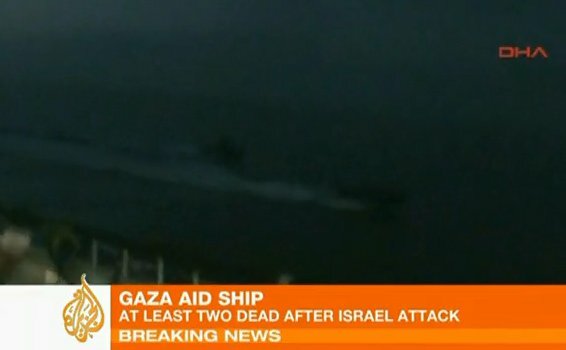 After several attempts to turn back the 'humanitarian flotilla' destined for Gaza, Israeli Defense Forces boarded the vessels and a deadly firefight broke out on one of the ships. Depending upon the source, it was reported that between 15 and 20 members of IHH, an Islamic aid organization linked to terrorist groups, were killed. It would appear that had the Gaza-bound flotilla simply permitted an inspection -- to ensure that its cargo did not include weapons for the murderous terrorist group Hamas -- none of the bloodshed would have occurred. The Israel Navy intercepted the flotilla after the protesters on board ignored Israeli warnings. IDF forces met with severe pre-planned violence from the demonstrators, including use of live fire and light weaponry. 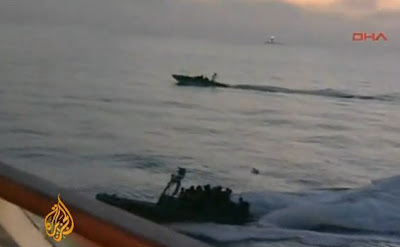 Early this morning, IDF Naval Forces intercepted six ships attempting to break the maritime closure of the Gaza Strip. This happened after numerous warnings from Israel and the Israeli Navy that were issued prior to the event. 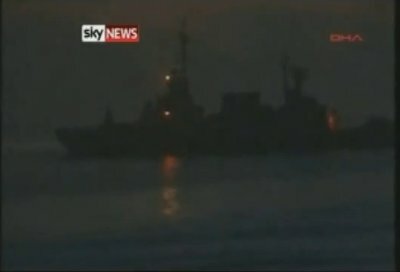 The Israeli Navy requested the ships to redirect toward Ashdod where they would be able to unload their aid supplies which would then be transferred over to the Gaza Strip after undergoing security inspections. 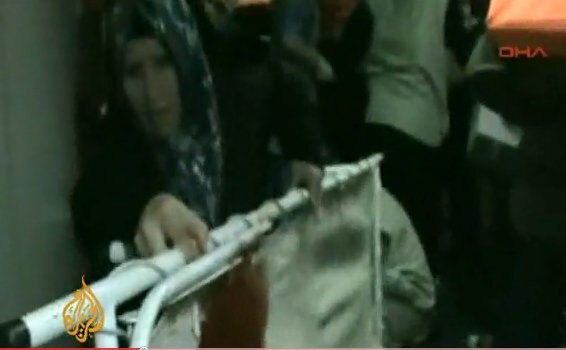 During the boarding of the ships, demonstrators onboard attacked the IDF Naval personnel with live fire and light weaponry including knives and clubs. Additionally, one of the weapons used was grabbed from an IDF soldier. The demonstrators had clearly prepared their weapons in advance for this specific purpose. As a result of this life-threatening and violent activity, naval forces first employed riot dispersal means, followed by live fire. According to initial reports, these events resulted in over ten deaths among the demonstrators and numerous injuries. In addition, five naval personnel were injured, some from gunfire and some from various other weapons. 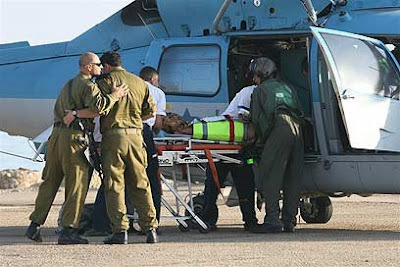 Two of the soldiers were seriously wounded and the remainder sustained moderate injuries. All of the injured parties, Israelis and foreigners, are currently being evacuated by helicopter to hospitals in Israel. 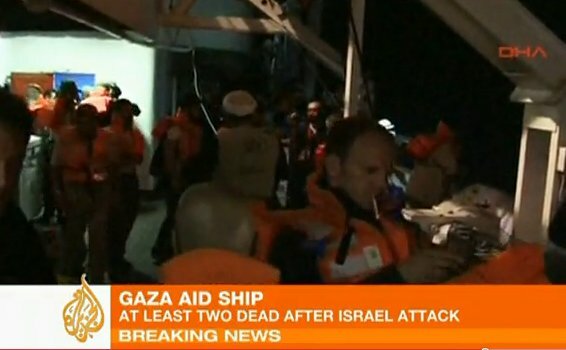 In the coming hours, the ships will be directed to the Ashdod port, while IDF naval forces perform security checks in order to identify the people on the ships and the cargo brought on board. The IDF Spokesman emphasizes that this event is currently unfolding and further details will be provided as soon as possible. This IDF naval operation was carried out under orders from the political leadership to prevent the flotilla from reaching the Gaza Strip and breaching the maritime closure. 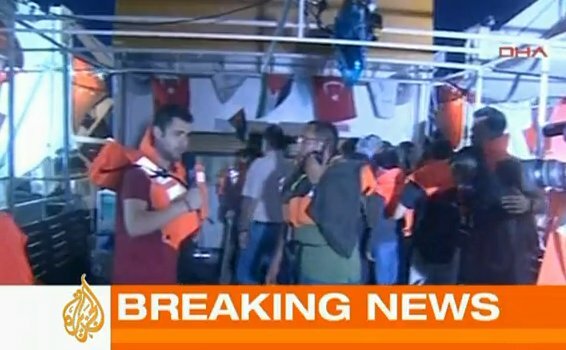 The boarding of ships in the flotilla followed numerous warnings given to the organizers of the flotilla before leaving their ports as well as while sailing towards the Gaza Strip. 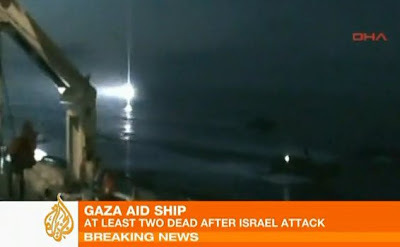 In these warnings, it was made clear to the organizers that they could dock in the Ashdod Sea Port and unload the equipment they are carrying in order to deliver it to the Gaza Strip in an orderly manner, following the appropriate security checks. Upon expressing their unwillingness to cooperate and arrive at the port, it was decided upon to board the ships and lead them to Ashdod. 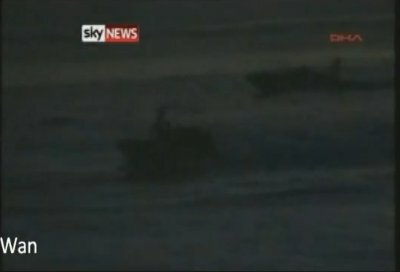 IDF naval personnel encountered severe violence, including use of weaponry prepared in advance in order to attack them, as well as having their weapons stolen by protesters and used against them. The forces operated in adherence with operational commands and took all necessary actions in order to avoid violence, but to no avail. So much for the "humanitarian" mission. Anyone willing to bet that inspections will show that the cargo included plenty of ordnance for Hamas? 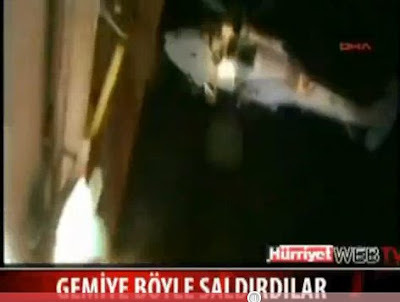 ...Mavi Marmara, the only ship on which violence took place, was different than the other five ships of the flotilla. 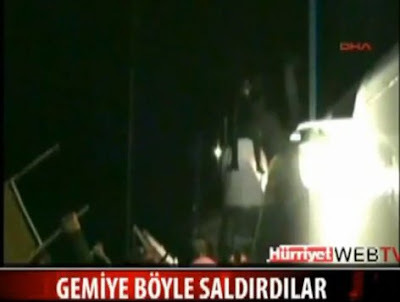 He said that five ships carried humanitarians and peace activists but the Mavi Marmara was sponsored by the extremist organization the IHH and those aboard acted in "extreme violence"... "Their intent was violent, their methods were violent and their results were unfortunately violent." Update II: Yes, the poor, innocent humanitarians, after resisting numerous radio warnings to turn back for a security inspection, opened fire on the Israeli Defense Forces. 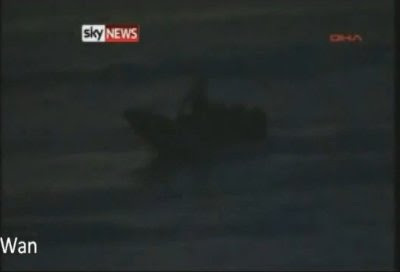 Five [Israeli] Navy commandos were also wounded, some of them from gunfire. At least two soldiers were seriously wounded. ...Upon boarding the ships, the soldiers encountered fierce resistance from the passengers who were armed with knives, bats and metal pipes. The soldiers used non-lethal measures to disperse the crowd. The activists, according to an IDF report, succeeded in stealing two handguns from soldiers and opened fire, leading to an escalation in violence. 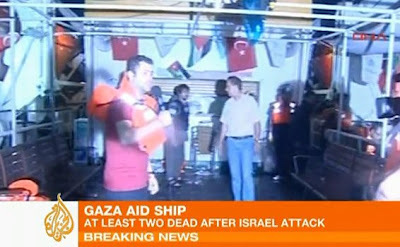 Al Jazeera on Monday broadcasted footage from the Gaza flotilla's lead vessel, the Mavi Marmara, showing Israeli Navy commandos boarding the ship. Helicopters could also be seen flying overhead. ...The IDF said that the ships would be taken to the Ashdod Port where, despite the violence, the cargo they hold will be inspected and then transferred to the Gaza Strip via land crossings. Anyone who is yet to understand how Hamas controls Israel will have another opportunity to get it via the Gaza-bound flotilla organized by ISM provocateurs (who this time chose to call themselves "Free Gaza.") The move aims to illustrate to the world how brutal and stupid Israel's occupation is. Update IV: The international gang of useful idiots reacts as expected. • French President Sarkozy called the conflict a "disproportionate use of force." Got you on that last one. I made it up, though give it a few hours and it may become reality. 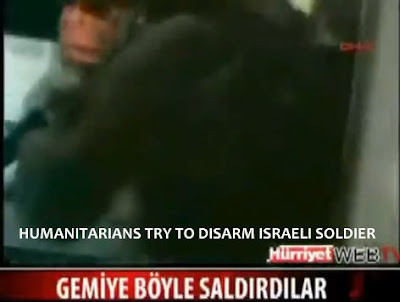 ...Ashkenazi said the soldiers were attacked with metal bars, knives and live fire, and noted that some of the wounded soldiers suffered gunshot wounds... video footage screened on Israel’s Channel 2 appeared to show one of those aboard the Marmara stabbing an IDF soldier. 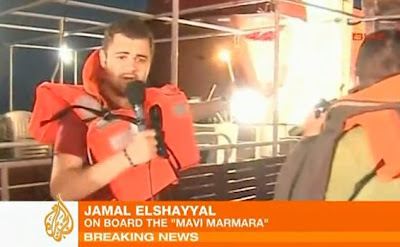 It would appear that the terrorists aboard the Marmara committed war crimes by using civilians as human shields. Try and contain your shock. Update VI: A higher-quality video from Sky News offers a better glimpse into humanitarians violently attacking Israeli forces. Update VII: John Hawkins has the must-read summary of reactions from left and right. And yet, without a doubt, Israel will be condemned by the United Nations and Israel-bashers the world over will use this event as another excuse to condemn and vilify the Jewish State. Agreed in both cases, that's why it's important to disseminate what really happened here! directorblue, I don't think it will matter. These people knew exactly what would happen if they violated the protection zone. That was their plan. They'll say IDF shot first, IDF says they shot first. Whom you believe will depend entirely on what you believed beforehand. I hope there is some clear evidence the IDF acted in self defense. Video camera...never leave home without it. This is just another Pali-wood production. Everybody BUT the IDF had a choreographed role to play. It is a VERY good thing none of the IDF personnel were captured. I think you need to go through this post and replace the word "humanatarian" with something more appropriate. These people are NOT humanatarian. My guess, anonymous, is that "humanitarian" is being used ironically throughout. Under interntaional law Israel's action were correct and appropriate. Thanks, Doug, for doing the grunt work. Isreal took the bait. They should have justed disabled the ship and let the screaming idiots float around for awile. THANK YOU FOR POSTING THIS! I wish the State Run Media had the guts to run it! "...are believed on reasonable grounds to be carrying contraband"
That's the rub isn't it? "Reasonable grounds" to the Israelis - who have been under constant attack by these people - will have a different definition than Muslim groups and the UN. The people who decide what is "reasonable" will likely be unreasonable people. 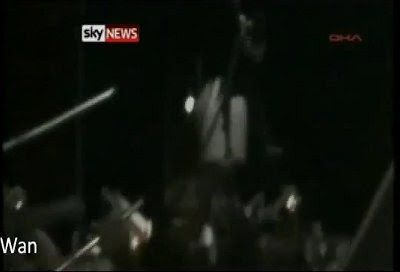 A friend tells me that the flotilla supporters produced a video showing Israelis attacking the "activists" but the audio that accompanies the video is of the "activists" attacking the soldiers! If you can find it, it might make for an interesting post. some of your reports are skewed. 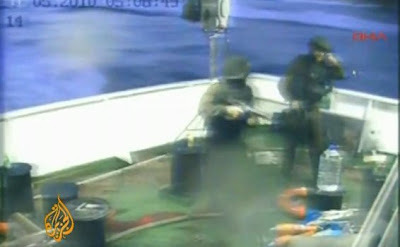 there is footage that shows idf firing upon the activists before landing on the ship. 5 of nine were shot in the back or in back of the head. israel deserves a place, but it isn't right to starve out the palestinians, or to take anymore land from them. So why is Egypt starving their brothers and sisters in Gaza? 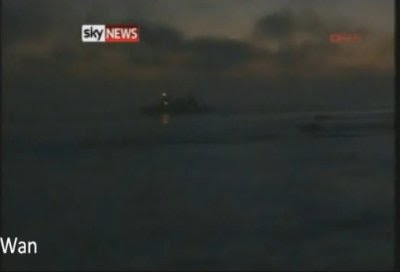 Have you seen the German reports on the flotilla?